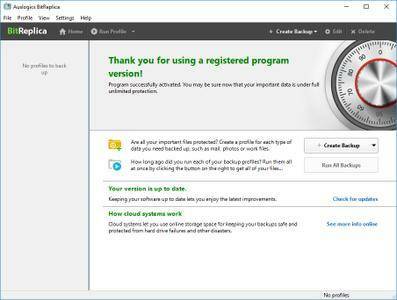 Auslogics BitReplica protects your photos, music, documents and any other data from being lost due to a hard drive crash, virus attack or accidental deletion. The program should be especially useful for anyone who has several storage drives (it could be several hard drives installed on one PC or several PCs networked together). Restoring the saved data is made easy too - you can restore the whole backup with just one click of the Restore button, or browse it like a regular folder and select individual items you would like to restore.